At Green Van Lines, our business model has always focused on affordable moving services and customer satisfaction above all else. We train each new employee in our exact methods, ensuring a level of proficiency and quality is always achieved, no matter the distance of the move. For local moves, our Colleyville movers will safely and securely pack each item in your home, load them onto the truck, and transport them to your new home or office. Moving down the block or across the city can often feel the same as moving across the country. You still need to pack each item, carefully label each box, and load the truck. With our local movers in Colleyville, the task of relocating your family or business becomes ten times easier. We have the skills and experience to ensure you are stress-free and prepared. At Green Van Lines, we understand the anxiety and fear involved with a long distance move. Many miles of traveling stand between you and your new home or office. Fortunately, our experienced movers in Colleyville make the process a breeze. We’ll transport your most prized possessions so you can focus on preparing yourself for the move. For swift and safe vehicle transportation services, trust no other moving company than Green Van Lines. Our Colleyville movers utilize specially designed car trailers and open car carriers to bring your vehicles across the country. We pick up your vehicles at your doorstep and deliver them to your exact destination. An industry move usually requires numerous phases and multiple trucks to successfully pack and load each item. Our project managers will provide on-site guidance and leadership, responding to your needs immediately. Relocating your business could cause quite a bit of stress without the help of our professional movers. 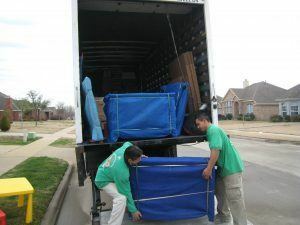 Our Colleyville movers understand exactly how much work goes into relocating an entire house. Between wrapping each item separately and organizing the moving truck successfully, the job can become overwhelming. Our Green Van Lines team members, however, are all experienced and trained individuals. We’ll do the work promptly and safely. Our trained staff will work closely with you to ensure they complete the moving process swiftly and securely. We will make sure that the interior of your building is readily available to make the process run more smoothly. Your office items, computers, and other equipment will all be adequately protected and packed safely. You can visit our main headquarters in Addison for all your moving needs. Our address is 4015 Belt Line Road, Addison, TX 75001. We serve entire Colleyville, TX 76034. Colleyville, a suburb of Fort Worth, emerged from smaller settlements along the Cotton Belt Route. The top employers in the community include Grapevine-Colleyville ISD, Market Street, and Lifetime Fitness. As you can see, there are plenty of opportunities for families in the area. Everyone is welcome to enjoy the small-town atmosphere! To hire the very best movers in Colleyville, call Green Van Lines at 888-770-4733. We’ll work directly with you to meet all your needs. The four-man crew that I had was absolutely wonderful. They really paid attention to detail ,we’re very fast and efficient!!!! I will Definitely use them on my next move.